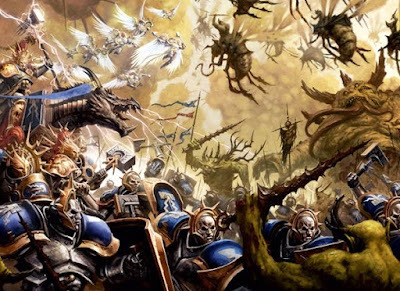 The Age of Sigmar opens up a ton of new things to Fantasy players. We now have more play styles to choose form, more basing choices, and more armies. However, the number one thing in my opinion that AoS opens up to the player base is the ability to craft your own lore and background within the realms. The Old World was great. It had a ton of character, a ton of history, and was a ton of fun to play in and explore. The one problem it had was the limits that those great elements set on itself. It had been around for 30 years and was only one world with limited real-estate. That pretty much meant that by the end of 8th edition almost everything had been explored outside of the eastern countries such as Cathay, and a few others like Estalia and Araby. If you wanted an Empire force they had to fit into the existing framework somehow, which could limit the theme for your army. It would be hard to justify coming up with your own Empire city for them to hail from. I ran into this issue when I was trying to develop the background for my Tomb King force. They had to fit into the existing city states somehow, which meant I had to wedge them into existing lore. This isn't always an issue, and sometimes it can lead to people creating some fantastic armies, such as an Empire army modeled to look like they come from Kislev. Some people also don't care about the lore for their army and just play the game for the sake of playing the game. That's all fine and there is nothing against any of that. The one thing I think Age of Sigmar has really opened up for the players though is the universe they have to play in. The Realms are pretty much infinite or so it seems, which is a pretty big sandbox to play in. If you want to model your army off of an "official" one, like Khul's Goretide, then there's certainly nothing stopping you from doing that. However, if you want to make a Free People's army representing a desert kingdom in the Realm of Beasts that incorporates both state troops and questing knights to hunt down monsters that is entirely within the realm of possibility now (ba-dum tshhh). 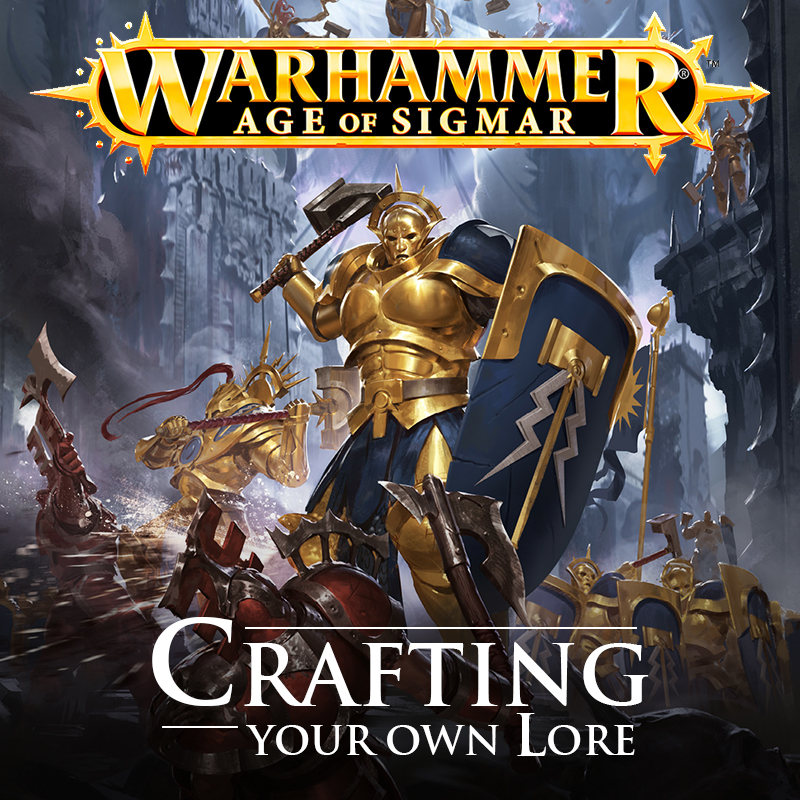 These new Realms are so large that you could create an entire kingdom and it would still never directly contradict any of the official lore that GW is laying down for AoS. You could run a campaign where some hugely important artifact is captured, or a city destroyed and it would be perfectly fine within the larger picture. It's simply running alongside the main storyline. Now obviously if you did something along the lines of Azyr being invaded, or Sigmar getting killed, that would contradict the official lore, but the same could be said for doing an invasion of Terra in 40k. My point is that there is so much more room to breathe in Age of Sigmar. You can really flex your creative muscles without feeling like you are destroying something sacred. I remember reading an interview with a Black Library author where they said one of the challenges with writing for Warhammer Fantasy was that anything major they did could, and most likely would, have repercussions for the whole world. In 40k this was much easier to avoid since something that happens on one world wouldn't necessarily have an impact on another. Even within armies like the Stormcast Eternals there is a ton of room to explore what you want. There are a ton of Stormhosts (the different colored armor) and also a bunch of Warrior Chambers within each Stormhost. When I was writing my battle report a few weeks ago I was inspired by the new lore and wrote small accompanying narrative bits to go alongside it. Since then, a simple name I came up with on the spot for my Lord-Celestant, Orros Firestorm, has further inspired me to delve deeper into the potential of the new Mortal Realms. A simple question of where he got his name from lead me to writing the following short story. The victorious cries of his warriors echoed off of the canyon walls as Lord-Celestant Orros Firestorm approached the small group of mortals now under their protection. It had been a stroke of pure luck that the Stormcast Eternals had come across the survivors as they battered their way through the Orruk warband. The fact that this small group had been able to hold out against the greenskins until the Stormcast had arrived was an impressive feat not lost on Orros. The eldest of the group, a wiry woman well into her forties, stood in front of the rest of her people, speckled with sweat and blood. “What are you?” the woman asked warily. She held her head up high, a crude axe in one hand, clearly trying to muster up what defiance she had left in the face of the unknown warriors. “Do not worry, we are here to help you. We are Sigmar’s storm made flesh, the Stormcast Eternals,” Orros proclaimed as he drew near the group. The tallest of their lot only reached up to his chest and the concern and fear was etched clearly upon their faces. He knew how he must look to them. A giant of a man, clad head to toe in golden armor covered in freshly spilt Orruk blood was not a comforting sight. Spying a fallen log nearby the Lord-Celestant sat down as he removed his helmet. Orros shrugged in indifference and sat his helmet down beside him, wiping some of the sweat away from his dusky scalp. She stared at the offered hand before grasping the wrist in a firm shake. “You fought well today. I have not seen the Orruk tribes routed like that in a long time. You must forgive my skepticism, Sigmar is a name we have not heard in these lands in ages, but it is a welcome one. If you truly fight for him then you and your kin are more than welcome.” The chieftain released her grip on the Stormcast’s wrist and sat down on the log beside him with an exhausted sigh. Seeing their leader accept the strangers, the rest of the mortals began to relax, tending to their wounded and marveling at the storm wrought demigods amongst them. “Has it truly been that long? How old are you?” she asked in astonishment. The pair sat in silence for a moment, Farosh massaging an ache out of her shoulder while Orros merely observed his warriors with his amber eyes. “You did not answer my question,” the chieftain ventured after a few more moments passed. “Once upon a time, yes. I grew up there, in a region known as the Desert of Ashes, bordering the Helios Mountains. I once lived in a city called Mireen, a jewel amongst the sands. Its walls were magnificent, taller than you can imagine and made of the purest white stone. A bustling trade city with the collected wealth of far distant lands, but that was not until closer to the end.” Orros seemed to trail off, his voice becoming unfocused. “You cannot remember your birth name, but recall exactly where you were raised?” Farosh challenged. “Some things you cannot forget, no matter how much you may want to,” he said looking down at the mortal. “When I was a child I did not live within the safety of the city’s walls. My family and I were part of a tribe that tended livestock through the foothills of the mountains. It was a good life. An honest life. It was not without its perils though, even before the coming of Chaos. During the Season of Flames there was always a risk and the wise amongst us begged for shelter within Mireen, or retreated into the crags of the Helios range. However, that was not always an option. One season my family was hard pressed for food and water after losing several of our herd earlier in the year to Orruk raiders. We were all set to weather the season amongst the mountains when one of our flock wandered off. We couldn’t afford to let it go so we set off after it into the sands of the desert. That’s when it struck. I had never seen anything like it before, an almost literal wall of fire and dust billowing out of the desert. The massive storm towered above us blocking out the light of the sun. The winds tore at us. The dust ripped at our skin. The fire and smoke burned us. The speed at which it happened was astounding, there was nowhere for us to run. As the storm approached my father held my mother and I tight, hoping somehow to save us from our fate through sheer force of will.” Orros paused, scratching at his jaw line. The Lord-Celestant stared down at his helmet with it’s fiery crest, now cradled in his gauntleted hands. A sombre expression plastered across his face. Farosh merely sat in silence, unsure of what to say to the demigod. Without warning Orros stood up, causing the log to shift alarmingly now free of his weight. The hot sun of Ghur above reflected off his golden armor, nearly blinding the chieftain with its brilliance. After a moment more of surveying his warriors and the surviving mortals he donned his helmet, his face once again an impassive mask of golden defiance and strength. “Aye,” the Prime replied solemnly. “Luckily for us there are still Orruks to hunt in these lands, and many more enemies of Sigmar beyond that.” Orros could hear the smile in the words. He clasped his Prime on the shoulder in silent thanks before mounting his dracoth while taking his Tempestus Hammer from a waiting Stormcast. One of the things I enjoyed most about writing that was developing the area he grew up in and the phenomenon that occupied it. I have almost complete creative freedom with what I want to do, since almost anything can fit. I hope to expand on Mireen and the desert it occupies in future stories, perhaps see what Orros meant by that he lived there closer to the end. Maybe he will visit the ruins of his city now? I'm sure it would be crawling with Bloodbound scum at this point. What has you inspired within the Mortal Realms? What stories and histories have you begun crafting for your heroes and armies? If you have any cool ideas or stories please share them in the comments below.